The first Judge Dredd was released in 1995. It was meant to be an explosive blockbuster featuring giant robots, wasteland mutants, and Sylvester Stallone as the titular Judge. It was a critical and commercial bomb, and also featured Rob Schneider as Stallone’s bumbling sidekick – because the two minutes of screentime the duo shared in 1993’s Demolition Man had audiences clamoring for more. (If you can find me a better reason, feel free to write a letter to the editor.) Fans of the original Judge Dredd comic, which premiered in the anthology series 2000 A.D. (1977), had two major complaints: a) It didn’t treat the material with the proper tone, and b) Stallone, like Tobey Maguire in Sam Raimi’s Spider-Man trilogy, can hardly keep his mask on for an entire scene. 2012’s Dredd responds to both charges with a vengeance. Both films take place in the futuristic Mega-City One, an overpopulated dystopia on the east coast of the United States stretching from Boston to Washington, D.C. With a population of 800 million and the sprawl surrounded by a radioactive wasteland, the city demands an extreme form of law, embodied in the Judges. Judges carry out the apprehension, sentencing and execution of criminals, and no Judge is more feared or respected than Judge Dredd. Dredd is a much smaller film than Judge Dredd. The latter took the audience on a rollercoaster ride through multiple set pieces and all sorts of futuristic gadgetry and mayhem. Dredd restricts itself to a single apartment complex that rises one kilometer above the city. It is a massive structure with a population of 75,000 and a 96% jobless rate, a miniature city in itself, 200 levels of despair. Limiting the action to one location keeps Dredd focused. The pacing is as tight as Dredd’s leather uniform and there is only one plotline: Find Ma-Ma, the reigning queen of vice in the Peach Trees complex, and judge her. A former prostitute in a city soaked in sin, the enemy is a victim that aspired to the giving end of violence. Ma-Ma is a fearsome adversary to the judges, played by Lena Headey like a scuzzy lioness. Unlike Judge Dredd, Dredd avoids any emphasis on futurism beyond the basic setting and weaponry. It prefers to gets its boots dirty in the destitution of Mega-City One, revealing it not as the special effects bonanza of the ‘90s but a slum of slums. The Judges are not cops but a symptom of the city’s extreme decay. 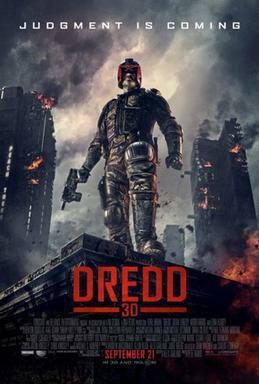 Dredd is a violent film, and Judge Dredd is a violent enforcer. But despite the fact that he never removes his helmet (a commendable concession by actor Karl Urban), his dedication to the law is obvious. Dredd is as noble a figure as Mega-City One can produce. He is completely incorruptible, and his grittiness is a byproduct of surviving his environment. Urban perfectly captures the comic version’s trademark frown, but not so convincing is his Clint Eastwood growl, which comes and goes over the course of the film. He shouldn’t have bothered. Dredd is a man of action, and those actions speak louder than sometimes-grizzled words. A dark film with little to no humor at all, it would seem that the setting precludes it. Yet the original comic (which is still going strong after 35 years) is actually a satire, and Dredd’s stoicism in contrast to the absurdity of Mega-City One’s denizens and helter-skelter geography provides much of the comedy. Neither 1995’s Judge Dredd nor 2012’s Dredd can quite bring themselves to send up American consumerism and bellicosity like its British source material, though Paul Verhoeven’s Robocop (1987) was able to do it with both humor and Dredd’s level of violence. To his credit, director Pete Travis clearly found more inspiration in Verhoeven than Stallone in creating his version of Mega-City One (there is a nice reference to Robocop when Dredd gives his attackers “twenty seconds to comply”). Dredd does not seek to profit from satirizing misery, and that is a sign of the times we’re living in. Robocop appeared at the height of the ‘80s, when greed was good and Reaganomics was trickling down onto the heads of the least fortunate. In 2012, the economy was not quite a laughing matter, and for all its sci-fi elements, Dredd is but an extrapolation of modern fears. For a small, violent shoot-em-up, Dredd is a well-crafted effort. It is not quite fair to label it as a remake of the ’95 version, as the comic’s long history allows for multiple interpretations. This version did everything possible to distance itself from its ’90s forebear, to no greater box office success. Unlike Judge Dredd, this film makes explicit that its fascist tactics do not better the society it depicts, and it does not seek to aggrandize itself with humor. It does unfortunately make for a one-note picture, honest but bleak. Very fun and bloody, which makes it all the more entertaining and I can only wonder what they will do with the next installments of this series, if they can get there. Good review Pierce. Thanks, CMrok93. Personally I’d like to see them get a little more humorous if they do a sequel. Not as campy as the ’95 version obviously, but something a little more like the bus-eating olympics in the comic. You’re absolutely right, it is definitely one-note, but solid; sturdy. Again, much to the chagrin of my peers, I liked the Dark Knight Rises, but primarily for the reason that they really have a lived-in city. Similarly, it’s why I enjoyed Land of the Dead, it’s a world that’s been living with a problem and Dredd aptly applies that formula. I feel like this film should’ve made more money and can only assume that others were like me, where we were introduced to Stallone’s Judge and found no reason to see another. While the comics may be the source material, to an average person (me), Judge Dredd is as unknown to the populous as Savage Dragon. It’s why I’m optimistic that the Netflix views and DVD sales will help spurn word of mouth. As I understand it Karl Urban is trying to get the sequel moving. I know I want to see more. Also, I like a lot of the subtlety in Dredd’s character. When the other “Judge” is shooting armor piercing rounds and Dredd glances over at the bullet hole in the wall and just humbly accepts that he’s about to take a shot — that was funny.